Dr Jenny Turner is able to offer both diagnostic and ultrasound guided injections as part of her assessment and treatment of joints, muscles and tendons. The use of a portable ultrasound machine within the St Martins Health Centre is an invaluable tool to help look at the injured or painful part of your body and can help to instantly confirm the diagnosis. The use of real-time ultrasound scanning during movement is useful to look at the activation patterns of muscle groups. An Ultrasound scan produces pictures of the inside of the body using sound waves. Ultrasound imaging, also called ultrasound scanning or sonography involves the use of a small transducer (probe) and ultrasound gel placed directly on the skin. High-frequency sound waves are transmitted from the probe through the gel into the body. The transducer collects the sounds that bounce back and a computer then uses those sound waves to create an image. Because ultrasound images are captured in real-time, they can show the structure and movement of the joints, muscles and tendons. Ultrasound scans are safe and painless. Ultrasound examinations do not use ionizing radiation (as used in X-rays), thus there is no radiation exposure to the patient. 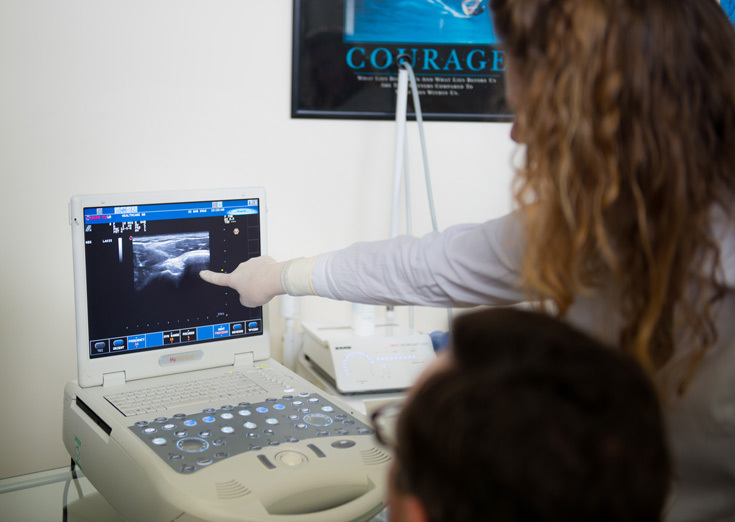 Ultrasound has been used in medicine since the 1950’s and there have been no confirmed adverse effects attributable to diagnostic ultrasound exposure in this time. You may need to remove clothing and jewellery in the area to be examined, so comfortable loose fitting clothing is ideal. No other preparation is required. The results of the ultrasound scan will be discussed with you immediately at the time of the scan. A written report will be recorded in your medical records and sent to your own General Practitioner along with the full clinical assessment and management plan. Will I need any other investigations? While ultrasound is an excellent imaging modality for muscles, tendons and ligaments it cannot penetrate bone. Therefore boney or cartilage problems may be better assessed by other imaging modalities such as X-ray, MRI or CT scans. If required these tests will be arranged for you at the Princess Elizabeth Hospital. What are the benefits of real-time ultrasound scanning? While we can see and palpate the superficial muscles, it is not possible to accurately assess size, quality or activation patterns of deep muscles, as these muscles lay beneath other larger, more superficial muscles. While superficial muscles are generally our power producers for movement, the deeper shorter muscles hug around our joint providing protection, stability and fine control of movement. Researchers have shown that there are often ongoing problems in our deep muscle systems in persisting pain states or recurrent injury. General strengthening programmes in these cases have often failed to normalize function in the deep system, even though the superficial system has become larger and stronger. This can sometimes make the problem worse – if you have larger muscles placing greater loads across joints that are relatively unprotected by an inefficient deep system, worsening pain or re-injury can occur. Deep muscles are particularly prone to inhibition. We know from research that pain inhibits deep muscles, and a lack of weight-bearing or poor postures can also negatively influence deep muscles around the spine and pelvis. The superficial muscles have been shown to be much less susceptible to inhibition, so if the deep system is not doing its job the brain ‘up regulates’ the superficial system to ensure you can still get from A to B (hunter & gatherer survival instinct). However, when superficial muscles try to do the ‘stabilizing’ job – 1. You become much less efficient using lots more energy for each task (remember you usually only use small muscles to do this task with less metabolic cost) and 2. The underlying joints are exposed to much higher compressive loads and shear forces, imposed by the big superficial muscles. This can make you feel tight, rigid or less fluid in your movements, more fatigued, and more painful, and the loss of efficiency may reduce athletic performance. Real time ultrasound provides an incredible opportunity to assess the health and function of these muscles, not only at rest, but also during active movement. No other imaging modality has the same versatility as ultrasound. We can then use ultrasound to help train you how to consciously activate your deep muscle systems and protect your joints more effectively prior to and throughout movement. It also helps us to teach you to ‘down regulate’ your superficial system making you less rigid and more efficient in your movements, and then we can strengthen both systems together in safe and balanced way.